Walt Disney Pictures has unleashed a new poster for Wreck-It Ralph, the studio's upcoming animated feature that literally takes us inside the video game world. John C. Reilly voices the title character, a villain who doesn't want to be the bad guy anymore. He sets off on a quest through several games to prove he can do good. Take a look at this one-sheet featuring Ralph and many other video game characters you may recognize, such as Sonic the Hedgehog and Q-Bert. You can also read on for the official press release announcing that the official soundtrack will be available October 30. The story of an arcade-game bad guy who embarks on a quest to prove he's really a good guy, Wreck-It Ralph journeys through wildly diverse arcade-game worlds, including the '80s-era, 8-bit video-game world of Fix-It Felix, Jr., the ultra-modern first-person shooter game Hero's Duty and the candy-coated cart-racing game Sugar Rush. Helping to differentiate these worlds from one another are unique cinematography, animation, effects and music. "Music is another way to set the stage and make these worlds completely different," said producer Clark Spencer. But not just any music. Filmmakers tapped diverse and unexpected artists to help tell the story. Composer Henry Jackman created the film's score, which is complemented by original songs and music from Skrillex, AKB48, Owl City and Buckner & Garcia. Directed by Rich Moore, produced by Spencer and featuring the voices of John C. Reilly, Sarah Silverman, Jack McBrayer and Jane Lynch, Wreck-It Ralph crashes into theatres on Nov. 2, 2012. The film's soundtrack from Walt Disney Records will be available Oct. 30, 2012. "When it came to the music of Wreck-It Ralph," said Moore, "we wanted to work with some really talented artists and I love that they aren't necessarily the people audiences expect to hear in a Disney animated movie. But when they hear the music and how it supports the story and drives the emotion, they'll say, 'This is perfect.'" Moore said he took his lead from the original director of animated movies. "Walt Disney was a pioneer when it came to music. What sounds like classics to us now - Ukulele Ike in Pinocchio, Peggy Lee in Lady and the Tramp - were very unexpected choices." 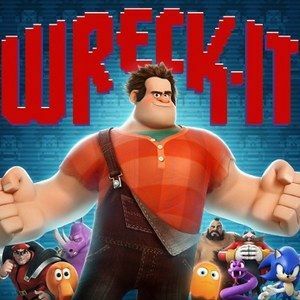 Classically trained composer Henry Jackman (Winnie the Pooh, X-Men: First Class) was called on to write the score for Wreck-It Ralph, helping to shape the diverse worlds with music. Jackman researched arcade games and incorporated their classic sounds into the score, bringing the arcade and its individual games to life. "The music transports you," said Moore. "It channels each era perfectly. [Henry Jackman] is fantastic." According to Jackman, the score was driven by the story, which allowed him to tap his classical roots, too. "When something emotional is developing, it actually opens the door to the orchestral score without it feeling imposed," he said. Ralph's quest leads him to the intense, cy-bug-infested world of Hero's Duty, where he hopes to land a medal. Underscoring the chaos and excitement of the first-person shooter game, GRAMMY®-winning artist Skrillex wrote the game-play music, "Bug Hunt," hand-picking Netherlands' producers/DJs/videogame soundtrack composers Noisia to remix the track for the album. "The mood of that game world is high-energy and futuristic. I make music with many different colors of the emotional spectrum-this reflects a more aggressive side of my music." Japan's pop phenomenon AKB48 accompanies Ralph to the land of sweets with the aptly named theme song "Sugar Rush." "We've always thought of Sugar Rush-with its nod to anime-as a game that may have originated in Japan," said Spencer. "So we went to Japan and got the hottest J-pop group to perform the song that really sets the tone for this '90s-era cart-racing game: young and hip." Owl City ("Fireflies," "Good Time") provides an upbeat and story-driven cap to the film with "When Can I See You Again?" According to singer/songwriter/instrumentalist Adam Young, the song offers a bit of an emotional tug-of-war. "It's a very bouncy, happy, uplifting song, but there's a bittersweet part of it, leaving a key relationship in the film open-ended." Also contributing to the end credits are Buckner & Garcia, the team behind the 1982 Top-10 hit "Pac-Man Fever." Jerry Buckner of Buckner & Garcia co-produced the song "Wreck-It, Wreck-It Ralph" with hit songwriter/producer Jamie Houston (Steven Tyler, Macy Gray). "It was great to be invited to contribute a song to the movie and soundtrack," said Buckner. "The song has an '80s pop flavor with a contemporary twist-we're really happy with how it turned out." From Walt Disney Animation Studios and Emmy-winning director Rich Moore comes Wreck-It Ralph, a hilarious, arcade-game-hopping adventure. For decades, Ralph (voice of John C. Reilly) has been overshadowed by Fix-It Felix, Jr. (voice of Jack McBrayer), the good-guy star of their game who always gets to save the day. Tired of playing the role of a bad guy, Ralph takes matters into his own massive hands and sets off on a journey across the arcade through multiple generations of video games to prove he's got what it takes to be a hero. On his quest, Ralph meets tough-as-nails Sergeant Calhoun (voice of Jane Lynch) from the first-person action game Hero's Duty, and feisty misfit Vanellope von Schweetz (voice of Sarah Silverman) from the candy-coated cart racing game, Sugar Rush, who may just be his first real friend. But everything changes when a deadly enemy is unleashed, threatening the entire arcade and Vanellope herself. Ralph finally gets his chance to save the day-but can he do it in time? Wreck-It Ralph crashes onto the big screen on November 2, 2012, in Disney Digital 3D™ in select theaters.